The pattern was designed such that when on it's side, a plane parallel to the bench represents the bottom of the hull. Although the 36.1mm dimension in the June sketch needs to be increased to 38.1mm to allow for the 3/4" laminate thickness missing from the original drawing. Having measured off the required transom depth a 36mm packer was required to position the pull saw at the required height. 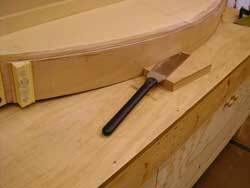 Working the pull saw around the base of the transom. When the transom was cut out it exhibited ~1" of spring. This will be pulled back in when bonding it to the hull. Having cut the transom according to the drawing with some check measurements off the hull I was expecting a better fit. It looked like it was off another boat! Having checked all sources of error I discovered that the final bulkhead was not square to waterline, so clamping to this pulled the transom off vertical. Ironically all the other bulkheads were set plumb and the aft bulkhead was set off the hull sides. This means the error must lie in the side panels not having square ends. The only fix was to trim the ends of the transom parallel with the aft bulkhead and use a packer. 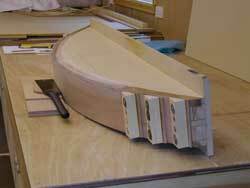 The picture shows the transom bonded to the hull floor and sitting square to waterline. 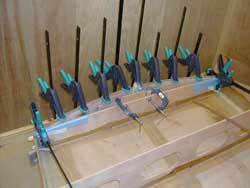 With the clamps removed the transom is bonded to the hull sides. 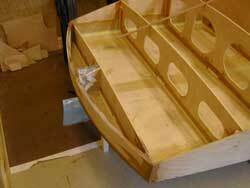 This is quite a milestone, it's 18 months since the plywood arrived in the workshop and technically this hull would now float. Next job is to order the timber for the shere and deck beams.